Here’s another peek into the new Loop magazine. Vol 3 is out in stands today in Japan. I’ll try to track down a copy and take some shots because it looks really rad. The issue will have two Brooklyn stories. One will be on Post Bike Shop and the other on local frame builders like Trackstar, Coast Cycle, Rosko, and Squarebuilt. 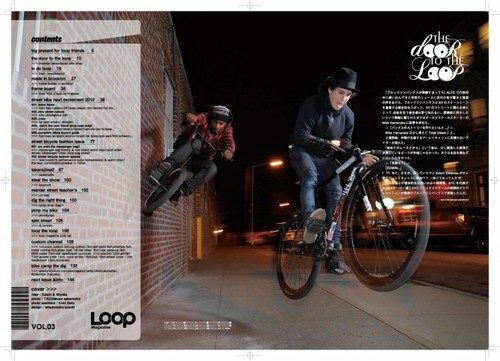 From the first feature, here’s Edwin hitting a wall ride and Ed Wonka mid-bunnyhop barspin. Tak calls this the “Double Ed”. Not bad for a cover and inside cover. 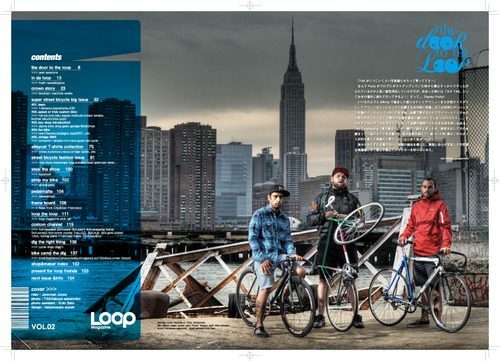 The last issue of Loop had Nate, Willis and me on the waterfront in Greenpoint. That shot is below. Really digging the direction Loop is taking with this publication. Some international (Brooklyn!) love and great photographs.